In my RTI (Response to Intervention) class, I use Marilyn Burns’ Do The Math program, which is wonderful for building conceptual understanding of fractions through the use of fraction strips. Students use the fraction strips to build equivalencies, make comparisons and add/subtract fractions. It does not take long for students to be able to “see” the equivalencies without having the strips in front of them and develop fluency and flexibility with fractions. In addition to this module, I do Number Talks with the group. I do a combination of whole number operation talks and fraction number talks. There were a few groans and “this isn’t hard“s because they went to 12ths and had the answer quickly. I told them if they had the answer, to try to use the strategy they had used in the previous problems to see if they got the same answer. I was thinking they would use a piece of the 3 to make the 1/2 and 1/4 a whole, but of course there is always one who surprises me! He had a beautiful explanation so I asked him to write it down for me so I could remember. He got a little mixed up in his wording, so I will do a translation after you check out his reasoning. He took 1.5/3 from the 2/3 to add to the 1/2 and make a whole. He then added the 1/2/3 to the 1/4. I, of course, asked him how he added that and his response was so beautiful as he explained it to me. 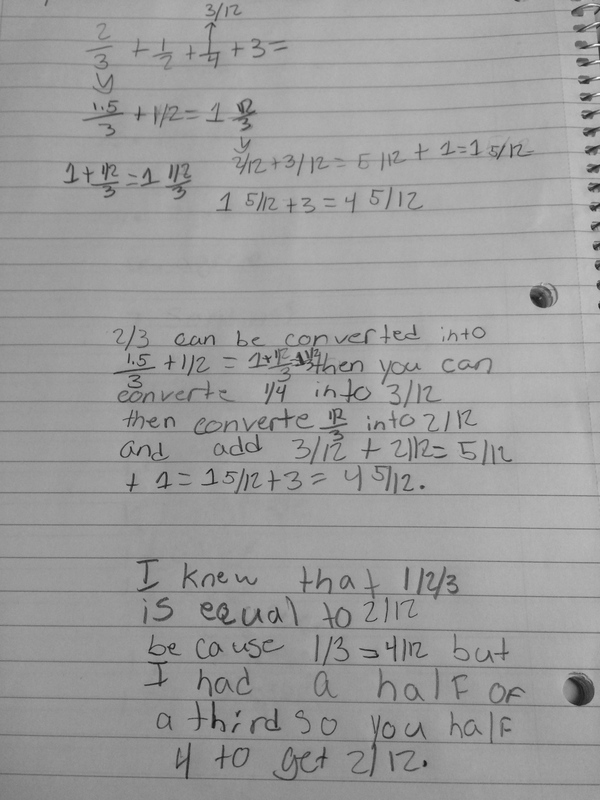 I mean how amazing is it that he knew 1/2/3 is equivalent to 2/12…and this was all mentally! Let me assure you that this student CAN add these fractions in a much more efficient way, and this was him challenging himself to play around with the fractions. THIS is what I would consider flexibility in operations and also where I want students to see math as fun…playing around with numbers! This entry was posted in 5th Grade, Fractions, Number Talks, Uncategorized on December 6, 2014 by mathmindsblog.